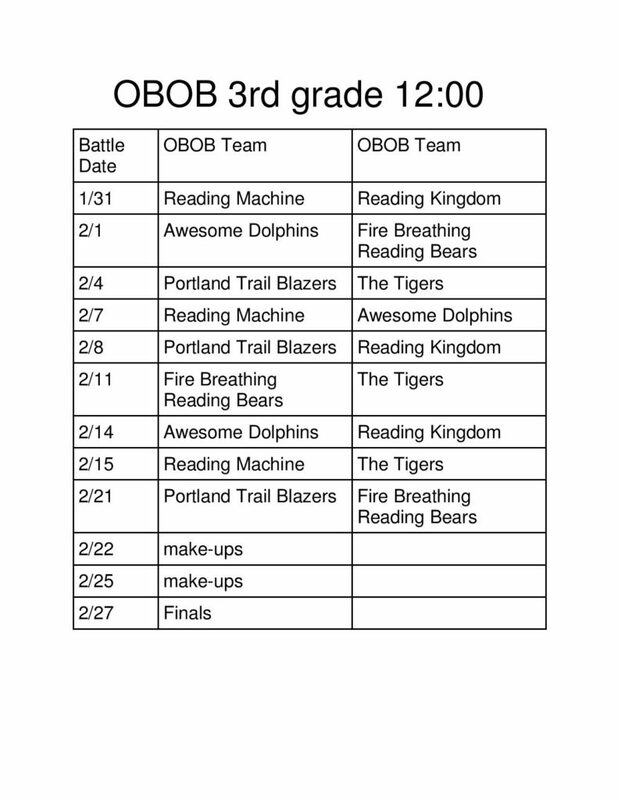 Oregon Battle Of the Books (OBOB) is at Cooper Mountain Elementary! Teams for Grades 3-5 are formed and preparing for battle! 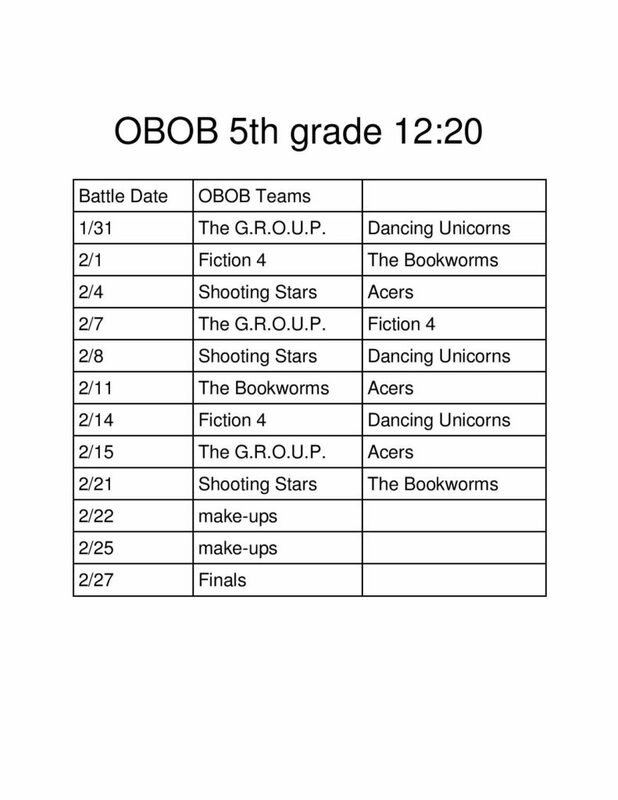 Check out the full battle schedule HERE! Week of September 17th – Ms. Long (our fearless Literacy Specialist) will come in and do a short classroom introduction to OBOB. September and October – Students will be given short trailers on the books during their library time. Monday, October 1 – OBOB team applications/parent permission slips will be put in teacher boxes, students may get them from their classroom teachers. Tuesday, October 16 – **Extended to Monday, October 22nd** Applications for teams are due to Ms. Long, teachers will collect them in classrooms and put them in her box. Wednesday, October 24 – Team pictures will be taken, students will come to Ms. Long’s classroom during their recess time after lunch to get their picture taken, the students will then be sent out to recess. Friday, October 26 – Teams will be introduced at the morning assembly. 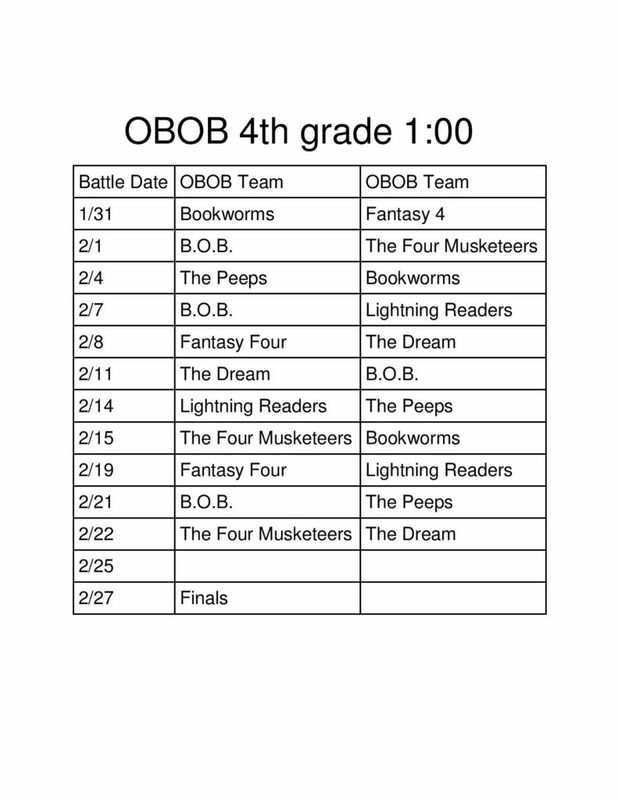 November and December – Teams will be reading books and having team practices outside of school hours. November 14 – Optional team practice/meeting in Ms. Long’s classroom during their recess at lunch/recess time. December 19 – Optional team practice/meeting in Ms. Long’s classroom during their recess at lunch/recess time. January 16 – Required meeting to review rules and give out battle practice schedule/battle schedule during lunch/recess. January 22, 23, & 25- Practice battles in Ms Long’s room during lunch/recess, students can attend any or all days. January 25- Clap-out at morning assembly, at the end of the assembly Ms. Long will announce the teams, they will stand up, take a walk around the gym before walking out with their class, students may wear matching shirts and/or make banners to carry during the clap-out. January 24, 12noon or 3pm AND January 29th 6:15pm– Volunteer training sessions for being an OBOB moderator/scorekeeper in Ms. Long’s room. Training will last 30-45 minutes, volunteers need only attend one. January 31st- First official battles take place, see full schedule below. February 27, 8:35am- Final battle in the gym. 3rd, 4th, and 5th are invited to watch. March 1 – Winning team will be introduced at assembly with trophy. April 6- State tournament at Chemeketa Community College.